OFFICE HOURS: 8:30am-6:00pm (summer months).9:00am - 5pm (winter months- office may be unattended). All paid checkin's arriving after hours will be left on office door in an envelope. The office will usually be shut from 10:00am-12:00pm for park cleaning and maintenance. If office is unattended after hours, contacts are listed on door. CHECK OUT: Sites & Cabins must be vacated by 10:00am. If re-booking please do so before 10:00am. Please return key & access card to return box. CHECK IN: After 2pm. Sites may be available after 11:30am. SPEED LIMIT: 10kph which is equivalent to walking pace. Please drive carefully and look out for children. BOOM GATES: Boom gate cards are for paying guests only and only one per site/cabin will be issued. Please use gate card provided to enter and exit the park. VISITORS: Must check into office before entering the park. Vehicles are not permitted in the park without management approval. All visitors to vacate the park by 10pm. Day visitor fee $5 per person above 10 years of age. SITES / PARK ACCOMMODATION: The person holding the license to occupy the site/accommodation is responsible for the conduct of all persons with them. The area must be kept clean and tidy at all times. Plastic tarps not to be placed on the ground as kills grass, breathable ones allowed. Management reserves the right to terminate any license at anytime without refund and to receive compensation for any damage to property, fair wear n tear in cabins or the need for excessive cleaning. A limit of 6 people per site and one motor vehicle applies. No flammable or dangerous liquids to be stored within 6 metres of cabins. No commercial waste to be disposed of in park rubbish bins. Please do not camp within 6 metres of lake as this is for all to enjoy. Strictly NO SMOKING in the park accommodation, camp kitchen areas or around non-smoking sites.Children Under 9 or intoxicated people not permitted on top bunks due to safety standards AS/NZS 4220:1994. Please do not drive over sites - use roads provided. No water ballons / bombs permitted within caravan park. Disabled toilets open during cleaning times for your convenience. Strictly NO SMOKING in the park amenities. Consider others and use the mop and sponge provided after using the facilities. Children are to be supervised by a responsible adult at all times. NOISE: To ensure everyone enjoys their stay, after 10:00pm is QUIET TIME except New Year’s Eve, 12:00am. Please be considerate at all times. LAUNDRY: The laundry is open at all times. The washing machines & dryers operate of 4 x $1 coins only. Washing machines take 40 minutes and the dryers take 45 minutes. No temporary clothes lines are allowed between the trees & bushes. RUBBISH: Please wrap all rubbish prior to placing in bin. Cans, glass, plastic,cardboard, paper, milk cartons are to be placed in the mesh recycling basket next to the bin. WATER: The mains are safe to drink. There is rainwater available from the tank near the laundry. Please note, water restrictions apply in this state and restrict your use of water accordingly. No washing of cars, caravans or boats under any circumstances. PLEASE REPLACE SCREW CAPS TO SULLAGE WHEN DEPARTING. ANIMALS: Strictly no animals allowed in park accommodation. A $200 bond will apply and the cabin will be checked on departure. All animals must be kept on a leash at all times. Droppings must be bagged & put in bin. Unruly or dangerous dogs not permitted within park. Park management accepts no resposibility for other people’s animals. Pets must not be left unattended. WASTE WATER-CASSETTES: These are not to be emptied in the amenities. A sullage dump point is provided. Please refer to map. Please use only septic friendly products. i.e. no NappySan. BIKES etc: Patrons may use these at their own risk. The following restrictions apply at all times: Headgear must be worn. No riding between dusk and dawn. Pedestrians & vehicles have right of way. The perimeter of the amenities & areas defined by white lines at the boom gates are NO GO ZONES. Ensure your children do not go through boom gates. FIRES: Prior permission is required from management and if permitted, must be in an elevated drum only, that can be provided for a charge. Fire Ban restrictions apply. Only allowed during months of May to end October. REFUNDS: May be available at managers’ discretion. We recommend taking out traveller's insurance. CAUTION: Beware of eroding lake banks, use boat ramp at own risk and be be mindful of overhead branches above sites. Please ensure that all valuables are locked away, Park Management accepts no responsibility for lost or stolen property. Thank you for reading this, most people never do! 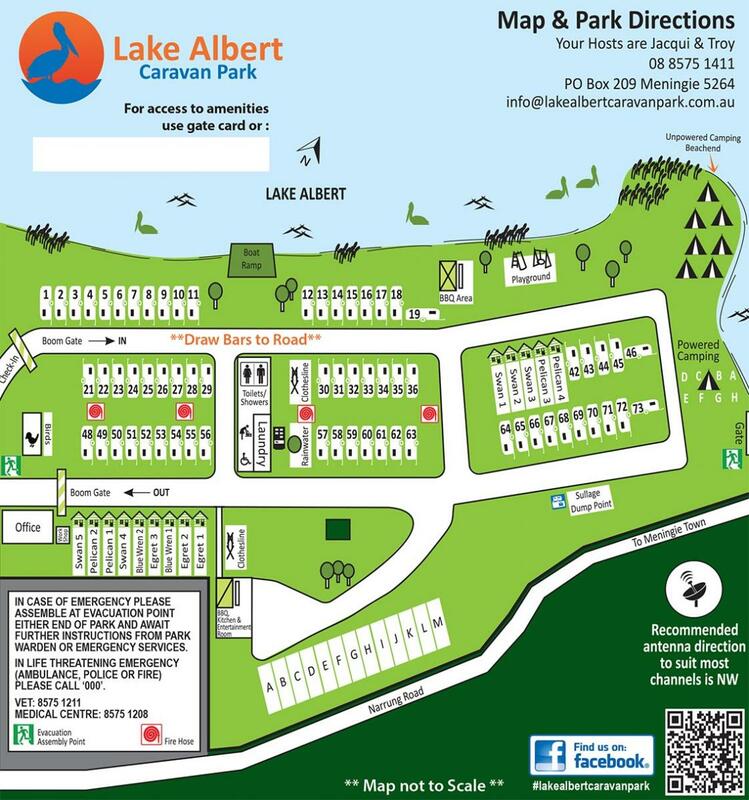 We hope you enjoy your stay at Lake Albert Caravan Park!